Fender guitars has the enviable distinction of being the first guitar manufacturer to offer a solid body model. The very first production model was called the Broadcaster®, the daddy of the famous Fender Telecaster®. This guitar corrected the hum and distortion problems experienced by many hollow-bodied instruments of the day. You see, Leo Fender was an inventor, always looking for a better way to do things. The Broadcaster® name came about because of Leo Fender's business interest in radio. Unfortunately, the name had to be changed to Telecaster® because Gretsch (ah, the irony! You'll understand later…) already had a drum kit called the Broadkaster and threatened to sue. The Broadcaster®/Telecaster® came out in 1951, the same year Fender introduced the Precision® Bass guitar. Between the two of these innovations, the groundwork was laid for future rock groups. Now you could have amplified guitars and basses. These took up less room and could easily be heard over (or along side) the drums and keyboards. You could also have a smaller band, not needing all the extra percussion to make the music loud enough to be heard in the clubs of the day. Of course, with the success of these new solid body guitars, this paved the way for competitors to jump on the "band wagon" – sorry for the bad pun! Soon Gibson, Gretsch and others were offering solid body guitars. Not too long after, in 1954, Fender released the Fender Stratocaster®. The Strat® has a huge following, with some of the best known players favoring Stratocasters. For example, Jimi Hendrix loved the Strat®, and Eric Clapton, with his Fender Strat®, is practically an institution. The Strat® is probably Fender's most successful six string. Some other models available are the Jazzmaster®, the Jaguar®, the Esquire® and the Mustang®. The Jazzmaster® has thicker "soapbar" pickups - still single-coil, but closer in shape to the original Gibson P90s. These pickups gave the Jazzmaster a warmer tone than the Strat® or Tele®. 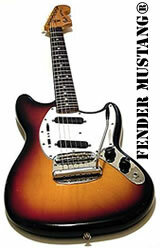 Here's a good background on Fender Guitars’ Jazzmaster® model. The Jaguar® was modeled after the Jazzmaster® but had a more complex electronic circuitry than the Jazzmaster®. The body style was almost identical, just a little shorter scale. You can see this here in the picture - look at where the tremolo is set a bit closer to the bridge. Read more about it here. The Esquire® has the same body style as the Telecaster®, the main difference being that the Tele® had two pickups, while the Esquire® had only one. According to this article, the Esquire® actually appeared in 1950 as a prototype. I didn't see this in the timeline on Fender's website, but it looks like they just glossed over the highlights there. You can get the Fender guitars history right here. The last guitar I'll talk about is the Fender Mustang®, seen to the right. This apparently came out in 1964 and was a favorite with musicians playing Surf music. Groovy, man. These are the most well-known models. There are other models floating around out there, such as the Musicmaster, the Bronco and the Duo-Sonic, which were considered more "student" models. If you happen to come across any of ’em, they're probably worth some money (head back here to check vintage values)! You can also get all sorts of Fender news right here. Over the years, Fender Guitars has become quite the conglomerate. They own a number of their former competitors: the Gretsch Guitar line (Fender took over production and distribution of Gretsch guitars in 2003 - remember what I said about the irony), the Charvel Guitar line, Guild and Tacoma Acoustic Guitars, Jackson Guitars and Squire Guitars. They have also added to their amplifier lines with XBRAND, SWR and EVH (Ya know, as in "Edward Van Halen"). Here are links to all these manufacturers. Look for the "OtherBrands" heading at the center of the Products page.